An Olympic gymnast, Herija Green was contracted by the United States government to infiltrate the sovereign nation of Parmistan and compete in the deadly “game” – a contest of endurance wherein anyone who survives is granted one wish. 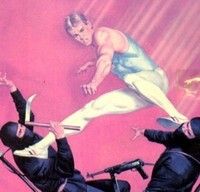 Green underwent months of intense training to prepare for his mission, successfully combining the skill of gymnastics and the kill of karate to emerge victorious. He also writes. Check out all of Herija Green’s articles here.